The hepatitis A test checks for hepatitis A total & IgM blood antibodies. What is this hepatitis A test? This hepatitis A blood test checks for HAV total and HAV IgM antibodies in the blood. Why is this hepatitis A test important? This hepatitis A test helps check hepatitis A immunity in the blood. This Hepatitis A Test is a blood test. The hepatitis A test, also known as a hep A blood test or an HAV lab test, measures hep A IgG and total antibody blood levels to check for hepatitis A immunity or a hep A infection. Hepatitis A is a disease caused by an infection with the hepatitis A virus (HAV). Hepatitis A infections typically occur through contamination in food and water from feces containing HAV. After an infection with HAV, some people develop symptoms in as soon as fourteen days. Affecting the liver, hepatitis A infections cause flu-like symptoms, nausea, vomiting, yellow skin (jaundice) and cramping. Symptoms can least up to six months and, rarely, liver failure can occur. There is no known treatment for hepatitis A. Most people in the United States have received the hepatitis A vaccine as part of their routine vaccines growing up. The hepatitis A vaccine consists of two doses of an inactivated vaccine and confers immunity for anywhere from ten years to a lifetime. The hepatitis A vaccine is sometimes administered to adults who want protection while traveling to a foreign country in which hepatitis A is a risk. This hepatitis A test, along with the polio titer and the Tdap titer, is used to check if hepatitis A immunity from prior vaccination is already present. Travelers and healthcare workers who demonstrated HAV immunity via the hepatitis A blood test can avoid getting hepatitis A vaccine series again. This hepatitis A test panel consists of two tests - the hepatitis A total antibody test and the hepatitis A IgM test. Using these two tests, the hepatitis A blood test measures the hep A IgG and total hepatitis A blood antibody levels (HAV IgG and HAV IgM). HAV IgG antibodies appear over a longer time period and typically indicate that one has immunity to hep A. HAV IgM antibodies are typically only present after an new hepatitis A infection and are typically negative in people with hepatitis A immunity without an active hepatitis A infection. To get a hepatitis A test near you at a Quest lab, simply order online and get your hep a blood test performed at a local lab. 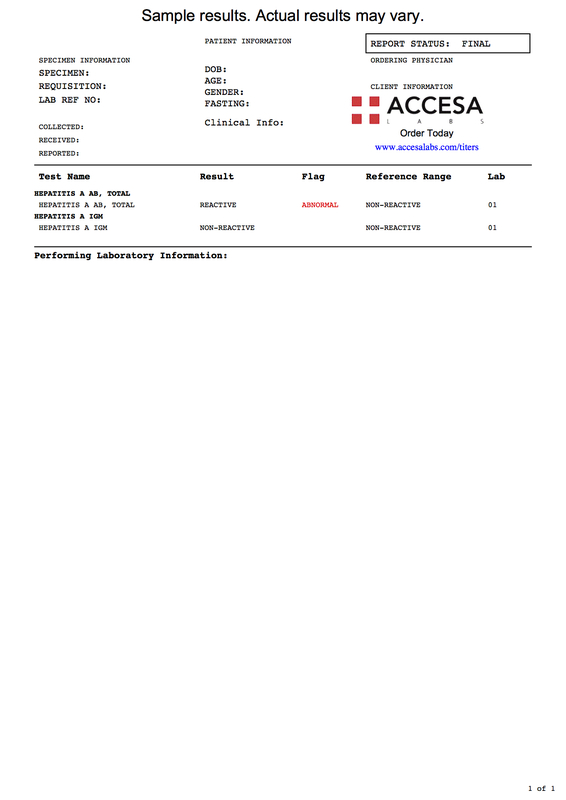 Once your hep A lab results are ready, they will be available for download. As can be seen on the sample hep A lab report above, the hepatitis A total and hepatitis A IgM levels will be reported as reactive (present) or non-reactive (not present). Hepatitis A Test at Guaranteed Prices.